I don't think I've ever been bought a beer by someone I've never met before. I've been sent a few beverages in the past to review, and I'm always grateful and honoured that a company would want a simple blogger such as myself to write about their products (that was an advert by the way), but I've never been bought a beer by someone I've never met if you see what I mean? Here I've been bought two beers. That in itself puzzled me. Are beers bought by people you haven't met like buses and two come along at the same time? If that is the case I may try an experiment in a couple of months time, say around the end of October. I could take a jaunt one specific night to the nearest public house whilst wearing a white sheet with a couple of holes for my eyes and stand at the bar with both hands outstretched whilst making a light pining noise or perhaps saying "Trick or treat!" I'll let you know how I get on. Anyway, I digress... 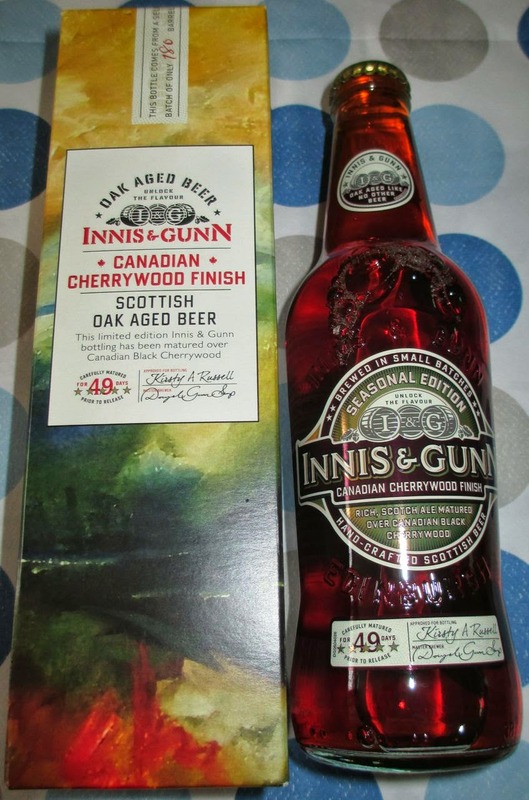 Thank you to Cinabar's work friend for buying me these two rather smartly presented bottles of the Seasonal Edition of Innis & Gunn Canadian Cherrywood Finish. I decided to drink them both whilst watching the women's tennis final match at Wimbledon on the box, or rather slaughter-match between Bouchard or "Skippy", as she did a little skip before each serve, and the scary tough Kvitova. The match started fairly well although poor Skippy probably should have spent the day stuck down a well as she was out gunned by Kvitova. The beer had spent some time sat in the fridge and the first bottle poured rather excitedly into my beer glass with bubbles and froth determined to escape. The beer had a deep copper colour and strong sweet malty fruity smell to it. On first taste this lively beer had a complex full bodied sweet malty fruitiness that complemented its following medium hoppy bitterness. It had an added touch of sweetness from the maple syrup which stuck with its Canadian theme, and also had clear woody undertones from the Canadian Black Cherrywood and oak aged finish. Right on the end of the palate there was the added liqueur kick from the bourbon, which had been infused into the cherrywood. This was indeed another fine quality Scottish beer from one of my favourite brewers, who have produced a beer that obviously had taken a great deal of care, thought and innovation. Optic, Crystal, and Aromatic Barley Malts were used, as well as Roasted Barley and Wheat. These had a longer boiling time in the copper to further caramelise the malt flavours. Their malty sweetness was balanced with the Goldings and Super Styrian hops used which helped to produce the beer's soft earthy bitterness. The brewer recommended trying this beer with figs and goats cheese, which sounded great to me. I'd certainly recommend you try this beer with a smoky barbecue if the weather holds up. Let's hope it becomes another regular on the shelf seasonal offering such as Innis & Gunn's Winter warmer Rum Cask.